Don't you wonder why some books gain iconic status while others, equally as wonderful, don't? ZEMINDAR is one of those books. A sweeping historical epic that accurately portrays life in India at the time of the Sepoy Mutiny (1st Indian War of Independence) of 1857. If you thought our own Civil War was bloody, read about the residence at Lucknow when under siege. Valerie Fitzgerald's family lived in India and her portrayal of both the country and the historical facts surrounding the uprising is fascinating. The book is long--I think over 800 pages, but you won't notice. You'll be fighting along with both the Indians and English, because she shows how the mutiny is instigated by foolish decisions. The story begins with Laura Hewitt, a single, poor relation to her cousin Emily heading from England to India on a trip. 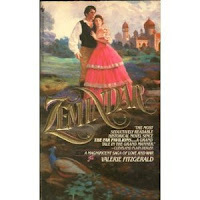 Emily marries Charles, and Laura goes with them to India for what she believes will be a vacation. Charles is related to Oliver Erskine, a powerful zemindar, which is the term for wealthy landowners in India. Zemindars not only ran massive estates, but meted out justice and controlled vast areas of land. Oliver is one of the wealthiest. Laura slowly becomes fascinated with both Oliver and India. She embraces the country even as it begins to unravel and she and Oliver, Emily, Charles and their servants slowly reveal their true characters when they are tested by war. Fitzgerald's descriptions of the battle scenes, the siege at Lucknow, and the political bumbling and outright criminal behavior gives a compelling description of a bloody stage in India and England's history. If you've read the FLASHMAN series by George McDonald Fraser you know how interesting the history of English occupation in various countries can be. While Fraser's protagonist is an anti-hero, Oliver Erskine is more akin to a Rhett Butler than Flashman, and Fitzgerald's Laura Hewitt begins as a quiet woman whose intelligence and fearlessness during a violent time causes you to root for her. She's no Scarlet--she's neither foolish nor vain. Instead she's more akin to an Elizabeth Bennett of Pride and Prejudice. Watching Oliver and Laura fight off hordes of attackers and flee through India makes for a classic action adventure novel. That the war they are fleeing was real makes it all that more gripping. You'll love this book. Valerie Fitzgerald never wrote another. I don't know why, but this one is a tour de force. Did you ever wonder how two people, especially two that are married to each other, can possibly write crime fiction together-- without murdering each other? We did. Luckily, we found someone who could tell us. Please welcome Aimee Thurlo, one half of the Aimee and David Thurlo writing team. It takes two - at least in the Thurlo household - to create a novel. Our collaboration works because the two of us make one terrific writer. Our partnership began after a long conversation where we each acknowledged our individual strengths and weaknesses as writers. We wanted to produce the best novels possible, so teaming up professionally seemed the logical way to go. The subsequent years became a continual learning process. Writing a book is an incredibly uneven, unpredictable process that often takes us on a roller coaster ride of emotional highs and lows. Adapting to your partner’s eccentricities is a must. Taking into account that each of us has our own set of skills, voice, and method of working, we knew right away that we’d have to establish certain ground rules. Sometimes, as it was in our case, it’s obvious who does what best. For example, my action scenes are horrendous. One time I got IUDs mixed up with IED’s. If David hadn’t caught it in time, our readers would have been rolling on the floor with laughter and our credibility lost forever. I also have no sense of direction, as evidenced by my driving skills. Without looking at my hands and/or wristwatch, I still have no idea which direction is left or right. Don’t even ask me to choose east or west. As a result, we decided right off the bat that David would choreograph all the action scenes and handle those details. However, there’s also a yin to that yang . David’s weaknesses as a writer are precisely where I excel. My strengths lie in dialog, characterization, and in bringing out the emotions, essential to any compelling storyline. Our latest Ella Clah mystery, Black Thunder, (Oct. 2011) is a perfect example of how our styles blend. In this suspenseful mystery Ella and her ad hoc investigative team have to track down a possible serial killer before he or she can strike again. At the same time, Ella struggles with pressures from home. Her little girl is now a teen with a mind of her own and those pesky, raging hormones that complicate every mom’s life. The reviews for Black Thunder, our seventeenth southwest mystery, have been excellent. PW said it was an "insightful portrait of a native culture still evolving between tradition and modernity." Booklist, the Journal of the American Library Association, also gave it a favorable review, calling Special Investigator Ella Clah a "compelling character", and promised that our story "should keep readers on their toes until the final pages." We also have a brand new romantic suspense novel coming out Nov. 1, Winter Hawk’s Legend. In this story Holly Gates must hide out with Daniel Hawk, the security expert sworn to protect her. She finds herself falling in love with him though, unlike her, he craves no home or family - just the same freedom as the great hawk. This is a story about the power of family, of hope, and the courage to defy the odds. Winter Hawk’s Legend is a landmark book - our 30th for Harlequin Intrigue. To date our publisher has sold more than a million copies of our Harlequins. To be compared to Hitchcock, at any level, made our year. I believe what makes David and I such a strong writing team is that we’re two very different people. We’re opposites in almost every way imaginable. For example, I take things way too personally. A mediocre review can put me either in the dumps or have me diving headlong into chocolate. David is calmer by nature, and his objectivity often helps me maintain an even keel. Even our approach to writing is different. I can spend countless hours working over a paragraph and have the ability to shut out all distractions when I’m on deadline. Unless the kitchen blows up and I find myself without coffee, I stay on target. David, on the other hand, has a hard time sitting still for long periods of time. He usually plots our books while on the move. Afterwards, I go over the details of the storyline and fine tune it. Once again, though our styles are different - or maybe because of it - we balance each other. Though our team has been very successful, our collaboration isn’t always smooth. The very fact that there are two of us working on the same words, pages, and story almost guarantees that there’ll be disagreements somewhere along the way. Since our first priority is the novel we’re working hard to create, we’ve agreed to settle those issues in a manner we believe is most beneficial to the work. If it’s an emotional or characterization problem, I have the last say, but David’s opinion takes precedent on any aspect of the plot or the actions scenes. The rewards of working as a team are clear. When it’s time to celebrate victories, you’ll always have someone who understands the sacrifices it took to get that starred review, or that brand new multiple book contract. Yet, as a married couple who also works together, achieving balance remains our greatest challenge. Pressure can wreak havoc on a partnership, be it business or personal, so it’s crucial for us to find time to do fun things together, too. On Saturdays or Sundays we might choose to watch a football game together while eating gobs of popcorn. At other times, we’ll take our trio of standard poodles for a walk in the bosque, the wooded banks of the Rio Grande, or go for a long car ride down country back roads. I'm halfway through a book tour for THE NINTH DAY and enjoying every minute. Even those minutes where I am the last in the restaurant when they're making the switch from breakfast to lunch and the coffee is burned from sitting for the past hour. While all my tours are fun, this one was made more so by the addition of Wendy Corsi Staub, a New York Times bestselling author. Harpercollins teamed us up and the trip became that much more enjoyable. We started out in Buffalo on the local morning show (WKBW- Linda Pellegrino http://.http://www.wkbw.com/programming/am-buffalo/video/Authors-Wendy-Corsi-Staub-and-Jamie-Freveletti---September-30th-130867263.html ) and headed to Dunkirk, where Wendy grew up. After Dunkirk we flew to Chicago for a few signings here. We capped the entire section of the tour off with a livestream event from the Poisoned Pen Bookstore in Arizona put together by Wendy's imprint, Avon and I got to go along for the ride. (You can watch it here: http://livestre.am/14puh ). We've laughed--a lot. As I was shooting down the freeway in upstate New York watching the beautiful countryside fly by I thought that the one lesson I'm trying to learn is to enjoy the moment. Live in the present and stop worrying about the next goal I've set for myself. This is particularly tough for me--I always feel as though I could be doing more-but on this tour with the laughter and wonderful time spent talking books I came very, very close. Thanks to the readers that came out to share in our book launch. I'm headed down the East coast of Florida and will update again when that is completed. In the meantime, I'll do my best to update on Facebook and Twitter and will cap it off with another post here. Well, I went and did it. I started my own personal blog. Still not sure why, except that it was time. I'll be staying at the Outfit as well, but now I'll have a chance to post stuff that is more -- well -- whatever I damn well want. 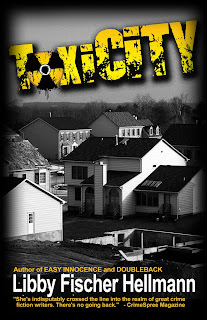 So... my first post on the new blog is the back story on TOXICITY. I hope you'll check it out and leave a comment. Or not. See you here and there.